I started a Bedrock Podcast at Podbean where I mainly do reviews and design discussion. Occasionally I also do interviews. You can check it out HERE. This week I reviewed three movies. The first was My Young Auntie, a classic martial arts comedy directed by Lau Kar-Leung and starring Kara Hui (who won a Best Actress award for her role). This is a very fun movie that brings together numerous genre elements. The fight sequences are great, with strong performances, but there is so much going on in this one, they can be easily overlooked. The second was Tigress of Shaolin, directed by Law Kei and also starring Kara Hui. I wasn't as big a fan of this one, though it has some cool concepts and the fight scenes were entertaining. The Third was the action film, A Moment of Romance, directed by Benny Chan and starting Andy Lau. This is another classic and well worth checking out. This was the Fifteenth session of a new Wandering Heroes of Ogre Gate campaign. See the THIRTEENTH SESSION LOG to read about the previous session. The party had recently been in the House of Paper Shadows where they rescued Hero Feng. They debated what to do, knowing that if they didn't bring him to Dawa of the Ten Talismans, then Ke-Yen's agreement would be broken. 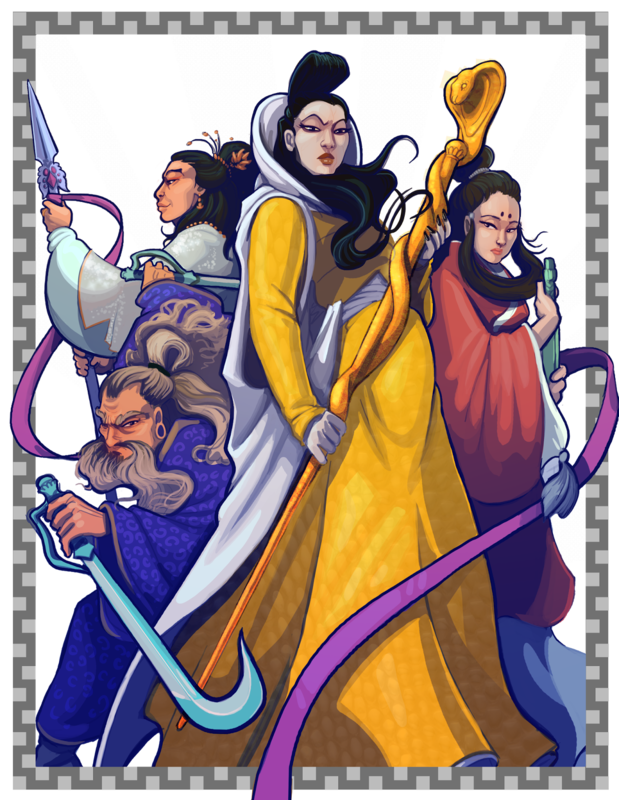 They decided to head north and trek through the mountains with Hero Feng to Heaven Palace Sect. No care for Wolf, but Ke Yen should saved at all costs. You no cower from that or I will know. They continued on but as they traveled through Hai'an they were approached by men wearing unusual clothing who claimed to be disciples of Majestic Lion Cult. They demanded 300 spades worth of tribute to their Iron Clawed Lion King for safe passage through their territory. Shin Du spoke saying "I have something better than mere gold, I have the most exquisite performance for you king." It was decided the group would go to Majestic Lion Palace to perform for Iron Clawed Lion King. They arrived and Shin Du instructed everyone in their roles. It should be noted only Shin Du understood the full array of skills required for such a spectacle and the material they were working with was notoriously terrible. Still Ke-Yen managed to dance exceptionally well and Shin Du, as always, sang and put on athletic feats that dazzled the audience. Iron Clawed Lion King stood and approached the group. "What a tremendous dancer," He said. "I have never seen such beauty in my life." He asked for the dancers name and was told she was Ke-Yen. Iron Clawed Lion King said he'd like her to join his sect. She said they had matters to deal with. But Shin Du stepped in and promised the group would return for another performance if the Majestic Lion Cult could help guide them to their destination. Iron Clawed Lion King agreed. That night they stayed in Majestic Lion Palace and Ke-Yen received fine teas and foods. In the morning there was a sedan chair awaiting her. She refused it, but the guide had it brought for the journey in case she needed it (he explained that Iron Clawed Lion King was concerned her legs would be damaged during the trip). The men guided them to Heaven Palace Sect. They brought hero Feng to the entrance and were told to wait. When they reached the central hall the group was brought before Dawa who was wearing a phoenix crown and standing next to a red robe and hat suspended in the air. As hero Feng approached she flicked her wrist and the robes wrapped around him, forcing him to act out the marriage ceremony. When the ceremony was over, she dismissed the party and they debated what to do while in the canyon. 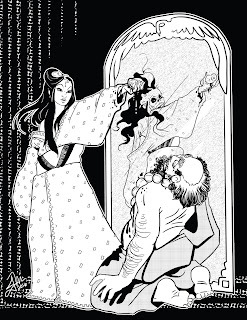 As the party debated the next course of action, Sister Fox and Shin Du snuck into a shaft above the door and found a small passage leading into Dawa's chamber. Sister Fox hurled bombs of Divine Powder into the room as they consummated their wedding. Dawa was naked except for the talismans. A massive explosion rippled through the chamber and Dawa screamed "Hero Feng, my love!" Shin Du fired a hail of arrows at her but she climbed into the shaft and struck him with a blue energy attack causing him tremendous pain and cold. He fired another hail of arrows upon her. She swirled her hand, rage burning in her eyes and a blue vortex throttled Shin Du's body, nearly killing him. He leapt forward and gripped the Talismans, then spun her in the air. When she landed it knocked her out. He took the Talismans and left. Disciples reacted and chaos broke out in the wake of the explosion. The party, for a time managed to not draw too much attention to themselves and act like they were helping. Shin Du even commanded some guards to head outside and find Dawa. 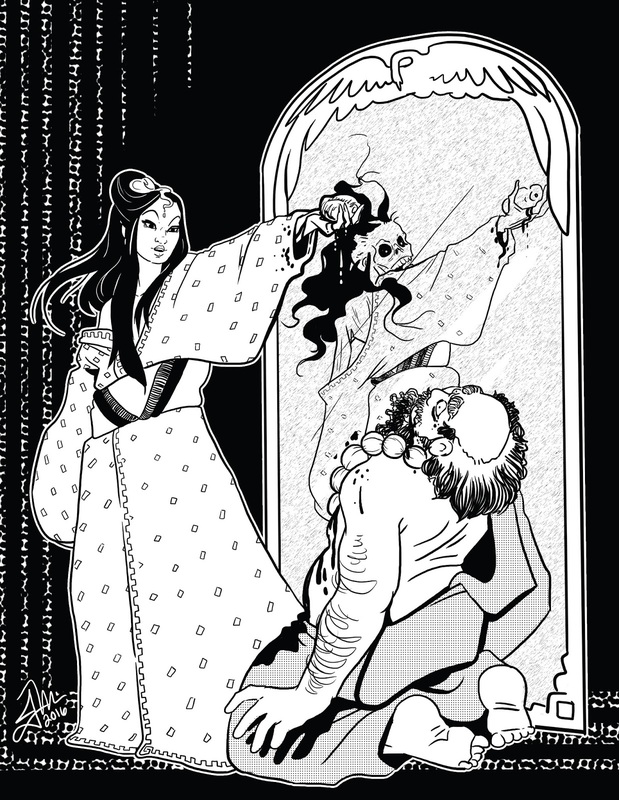 They went to the main chamber and Shin Du asked Qinwen (who was suspended on the wall with all his limbs cut off) how to destroy the Talismans. "They cannot be destroyed," he laughed. "They are fundamental to the world." 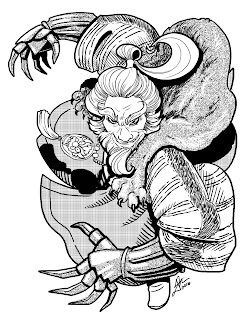 Shin Du fired an arrow into Qinwen's head to release him from his suffering and joined the group to flee from the area. As they were making their way up the mountain side, disciples called after them and told them to remain where they were. They were chased and ran as best they could. Shin Du fell behind and was encircled. The party leapt to his defense and Song Pei helped him escape by calling forth a plume of smoke. They eventually outran the disciples and made it to the Banyan. Along the way, Ke-Yen fashioned a talisman to enhance her dancing as her skills were not that great and she felt she had just been lucky the first time she performed. In seven days they reached Heaven Palace Sect and Ke-Yen performed once again for Iron Clawed Lion King. "Such unspeakable talent. Please join my sect so I may see this dancing every day." Ke-Yen explained that they had other matters to tend to and that she was already the disciple of another Sifu. "Very well," he said. "Then please return for another performance in the future." 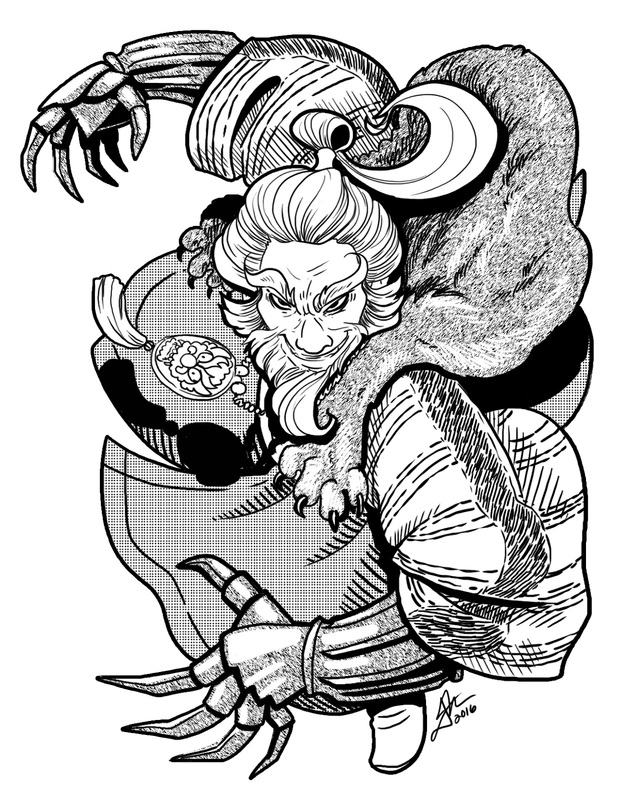 Iron Clawed Lion King announced "I pledge that if anyone harms Ke-Yen's legs, I shall remove theirs." He looked at the party and said "If anyone ever bullies her or gives your group trouble, you can call on me for assistance."